Dell and Sony admit that flaws in Sony-manufactured batteries used in certain Dell laptops could result in the batteries overheating, catching fire, or exploding. They recall over 4.1 million batteries, the largest computer-related recall in history. 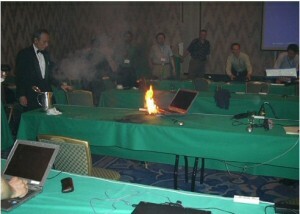 This came after several widely publicized reports in the preceding months where Dell laptops did catch fire. Still to this day, Dell’s reputation has never fully recovered from the incident.